Director: John Krasinski. 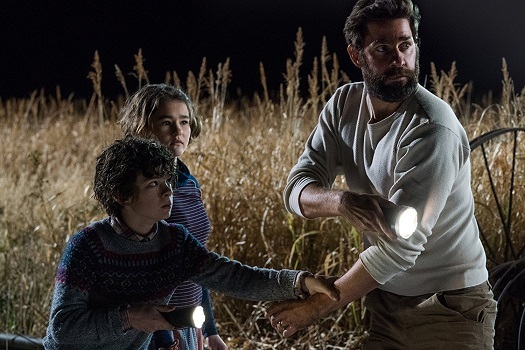 Cast: John Krasinski, Emily Blunt, Millicent Simonds, Noah Jupe, Cade Woodward, Leon Russom. Screenplay: Bryan Woods, Scott Beck, and John Krasinski. Twitter Capsule: Veers from competent to preposterous in all departments, from its clunky script to its heavily storyboarded direction. Second Capsule: Ssshh!! Emit one decibel of feminism and they'll hear you! Okay, maybe a few iffy ones, but not til the final scenes! Third Capsule: For a movie so dedicated to silence, it sure never tires of declaiming its themes or its 48pt-font character motives. Fourth Capsule: Mel Gibson called and wants his crop circles back. He applauds you, however, on your zealous reproductive ideologies. VOR: ③ Has reaped some credit for formal conceits and its frankly queasy handling of disability. More noteworthy as a possibly unwitting neocon time-capsule.